A rapid approach to investigate interactions and effects on molecular mechanisms related to the presence of antibodies in an intracellular environment is described. The method involves transfection of antibodies into live cells using a non-covalent complex formation based on a lipid formulation. The technique is adaptable to immortalized cell lines and primary cells. Douglas, J. N., Gardner, L. A., Lee, S., Shin, Y., Groover, C. J., Levin, M. C. Antibody Transfection into Neurons as a Tool to Study Disease Pathogenesis. J. Vis. Exp. (67), e4154, doi:10.3791/4154 (2012). Antibodies provide the ability to gain novel insight into various events taking place in living systems. The ability to produce highly specific antibodies to target proteins has allowed for very precise biological questions to be addressed. Importantly, antibodies have been implicated in the pathogenesis of a number of human diseases including systemic lupus erythematosus (SLE), rheumatoid arthritis (RA), paraneoplastic syndromes, multiple sclerosis (MS) and human T-lymphotropic virus type 1 (HTLV-1) associated myelopathy/tropical spastic paraparesis (HAM/TSP) 1-9. How antibodies cause disease is an area of ongoing investigation, and data suggests that interactions between antibodies and various intracellular molecules results in inflammation, altered cellular messaging, and apoptosis 10. It has been shown that patients with MS and HAM/TSP produce autoantibodies to the intracellular RNA binding protein heterogeneous ribonuclear protein A1 (hnRNP A1) 3, 5-7, 9, 11. Recent data indicate that antibodies to both intra-neuronal and surface antigens are pathogenic 3, 5-9, 11. Thus, a procedure that allows for the study of intracellular antibody:protein interactions would lend great insight into disease pathogenesis. Genes are commonly transfected into primary cells and cell lines in culture, however transfection of antibodies into cells has been hindered by alteration of antibody structure or poor transfection efficiency 12. Other methods of transfection include antibody transfection based on cationic liposomes (consisting of DOTAP/DOPE) and polyethylenimines (PEI); both of which resulted in a ten-fold decrease in antibody transfection compared to controls 12. The method performed in our study is similar to cationic lipid-mediated methods and uses a lipid-based mechanism to form non-covalent complexes with the antibodies through electrostatic and hydrophobic interactions 13. We utilized Ab-DeliverIN reagent, which is a lipid formulation capable of capturing antibodies through non-covalent electrostatic and hydrophobic interactions and delivering them inside cells. Thus chemical and genetic couplings are not necessary for delivery of functional antibodies into living cells. This method has enabled us to perform various antibody tracing and protein localization experiments, as well as the analyses of the molecular consequences of intracellular antibody:protein interactions 9. In this protocol, we will show how to transfect antibodies into neurons rapidly, reproducibly and with a high degree of transfection efficiency. As an example, we will use anti-hnRNP A1 and anti-IgG antibodies. For easy quantification of transfection efficiency we used anti-hnRNP A1 antibodies labelled with Atto-550-NHS and FITC-labeled IgG. Atto550 NHS is a new label with high molecular absorbtion and quantum yield. Excitation source and fluorescent filters for Atto550 are similar to Cy3 (Ex. 556 Em. 578). In addition, Atto550 has high photostability. FITC-labeled IgG were used as a control to show that this method is versatile and not dye dependent. This approach and the data that is generated will assist in understanding of the role that antibodies to intracellular target antigens might play in the pathogenesis of human diseases. Bring the buffer up to a pH of 8.4 with this solution (10.6 g Na2CO3, 29.2 g NaCl, 1 liter H20). Add 35 μl Atto550 NHS to 70 μl anti-hnRNPA1 and 500 μl NaHCO3 buffer and rotate for 1 hr at room temperature. After the hour-long rotation, inject the mixture into a dialyzer and dialyze in 2 liters of PBS overnight. The next day, concentrate the dialyzed Atto550 NHS anti-hnRNPA1 using a spin column (Amicon Ultra 0.5). After the Atto550 NHS labeled anti-hnRNPA1 antibody has been concentrated, nano-drop sample to determine the concentration. Seed 105 cells/well into 500 μl of Dulbecco's Modified Eagle Medium (DMEM/F12+10% FBS+1% antibiotic) in an 8 well slide 24 hr prior to transfection. Cell confluency should be at least 70%. Twenty four hours after seeding, add 2 μl of Ab-DeliverIN reagent into an Eppendorf tube. Next, add 2 μg of Atto550 NHS labeled anti-hnRNPA1 antibody (0.5 μg/μl) to the same Eppendorf tube and incubate 10-15 min at RT. During the incubation, aspirate media and add 394 μl of fresh DMEM media to the cells. Note: Add 500 μl DMEM to one chamber of untouched cells to act as a control. After incubation, add 100 μl of DMEM to the antibody mixture, mix by pipetting up and down, and add to the cells in DMEM for a total volume of 500 μl. Change the media after 48 hr of antibody delivery. Note: Protocol was repeated with FITC labeled rIgG as positive control. Image cells live at 48 hr using the Cy3 filter on a fluorescent microscope to image the transfected Atto550 NHS labeled antibodies. After live imaging has been completed, aspirate the media and fix cells. After aspirating media, treat cells with 0.4% Paraformaldehyde for 15 min at room temperature. Wash cells 4 x 5 min each with PBS. Then, mount cells with mounting media containing DAPI reagent and fix coverslip. Measure transfection efficiency of the fixed cells with Axiovision software. If Axiovision software is not on hand, simply count the events from your image by hand and plug results into calculation in 3.7. Alternatively, ImageJ software can be used for these calculations. First, use the "Events" measurement to count the total number of cells in your image of choice at 20x magnification. Next, use the "Events" measurement to count the cells that were not successfully transfected with antibodies in the same 20x magnification image. To access the measured "Events" in an Excel style format, click on "Properties", click the "Measurement" tab, and click to view "As Table." Finally, use the following calculation to determine your transfection efficiency by comparing the two previously measured events: ((Total cells - Untransfected Cells) / Total Cells) x 100 = Transfection Efficiency. The live images of untransfected (Figure 3A) compared to transfected (Figure 3B) neurons reveal that the labeling of the antibodies (red or green in each figure) is clearly observed within cells (Figure 3B, C, D). Following aspiration and washing with media to remove antibodies between or adherent to the surface of cells, labeled antibodies are still present within neurons (Figure 3C, D). To calculate the transfection efficiency, use the Axiovision software to calculate total cells compared to cells that were not successfully transfected. These values were entered into a transfection efficiency formula to acquire the transfection efficiency as a percentage of total cells (Figure 4). Figure 1. Flow diagram of the procedures used to label antibodies with the Atto 550 NHS ester followed by steps required to concentrate the labeled antibodies. Click here to view larger figure. Figure 2. 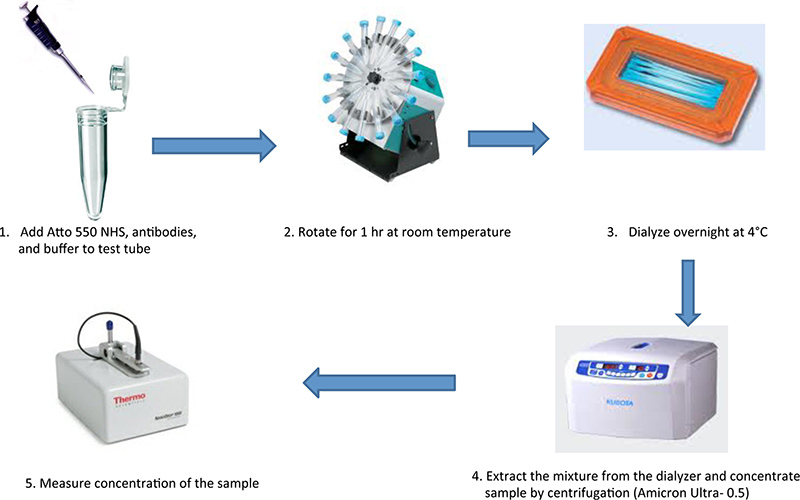 Flow diagram of the procedures used to transfect labeled antibodies into live cells in culture. Click here to view larger figure. Figure 3. Live images of the transfected neurons 48 hr following transfection. Figure 4. 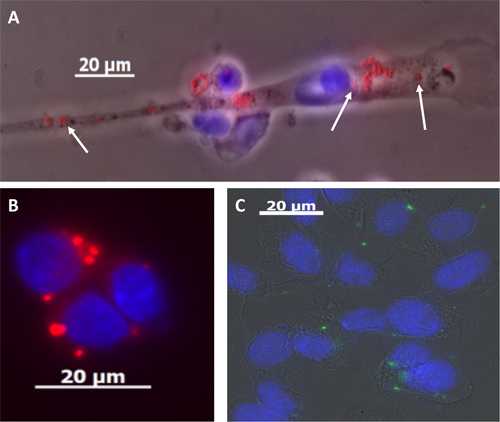 Fixed and rinsed images with events counted in order to determine transfection efficiency. In order to test hypotheses about specific molecules and their expression, genes and other vectors are commonly transfected into cells. The unique aspect of this procedure is the ability to easily transfect antibodies into target cells. We performed this method in five separate experiments each in duplicates. Transfection efficiency results were similar among all experiments. Importantly, the method enables entry of antibodies into the cell without altering antibody structure or function. Further, with the use of fluorescence microscopy of live neurons, we are able to determine transfection efficiency, which commonly exceeds 55%. This allows one to test hypotheses related directly to the interaction between the antibody of interest and its intracellular target. Although not studied here, Fab fragments can also be utilized. Alternatively, experiments can be designed that examine if altering culture conditions such as adding inflammatory cytokines affects expression or localization of intracellular targets. How antibodies might target intracellular antigens is an ongoing area of investigation. Prevailing theory indicates that following cellular injury, intracellular antigens are exposed to the adaptive immune response, which allows for antibody production to the target antigen. The antibody response to hnRNPs in SLE patients is an example of how this likely occurs. SLE patients make antibodies to hnRNP P2 and upon apoptosis of target cells, hnRNP P2 is transported to the cell surface where it is available to generate an autoimmune response 14. This was also shown in neurological disease, in which studies suggested that only surface antigens on neurons could be targets for a pathogenic autoimmune response 15, 16. This idea is now being challenged. Interestingly, there is now data suggesting that antibodies can enter neurons in an epitope specific manner. For example, in autoimmune retinopathy, anti-enolase antibodies penetrated neurons and altered the function of enolase, a cytoplasmic glycolytic enzyme 17. Further, in a model of stiff-person syndrome, anti-amphiphysin antibodies entered neurons in vivo, co-localized with pre-synaptic markers and altered GABA release 18. This might be related to the unique structure and function of neurons. Studies like the one presented here address these important issues, as the pathogenesis of autoimmune disease continue to be studied and better understood 9.
hnRNP A1 is an intracellular antigen 5, 9. Therefore, we required a technique that would allow us to test whether anti-hnRNP A1 antibodies might contribute to neuronal dysfunction. Because autoantibodies to hnRNP A1 were found in MS and HAM/TSP patients 3, 5-7, 9, 11, we transfected anti-hnRNP A1 and control antibodies into neurons. We confirmed that antibodies entered the cells and following microarray analyses (using both control IgG and untouched neurons as controls) showed that genes related to hnRNP A1 function were altered, thus confirming that transfection did not alter anti-hnRNP A1 function 9. Importantly, further microarray analyses showed an association between the anti-hnRNP A1 antibody response with altered expression of spastin, a gene which when mutated, mimics the clinical phenotype of MS and HAM/TSP patients 9. This shows that antibody transfection can be used to test whether antibodies to intracellular targets can alter cellular functions. This has utility with a number of other autoimmune diseases such as SLE, RA, and the cancer-related paraneoplastic syndromes. In summary, the ability to reliably transfect antibodies into living cells provides the opportunity to ask questions of antibody function, antibody: target interactions and localization of targets within cells under normal and disease conditions. This work is supported by the Office of Research and Development, Medical Research Service, Department of Veterans Affairs. This study was funded by a VA Merit Review Award (to MCL) and the University of Tennessee Health Science Center Multiple Sclerosis Research Fund. Burkhardt, H. Epitope-specific recognition of type II collagen by rheumatoid arthritis antibodies is shared with recognition by antibodies that are arthritogenic in collagen-induced arthritis in the mouse. Arthritis Rheum. 46, 2339-2348 (2002). Chester, K. A. Lambert-Eaton syndrome antibodies: reaction with membranes from a small cell lung cancer xenograft. J. Neuroimmunol. 18, 97-104 (1988). Lee, S. M. HTLV-1 induced molecular mimicry in neurological disease. Curr. Top Microbiol. Immunol. 29, 125-136 (2005). Reeves, W. H. Systemic lupus erythematosus. Antibodies to DNA, DNA-binding proteins, and histones. Rheum. Dis. Clin. North Am. 20, 1-28 (1994). Levin, M. C. Autoimmunity due to molecular mimicry as a cause of neurological disease. Nat. Med. 8, 509-513 (2002). Lee, S. M. Autoantibodies that recognize functional domains of hnRNPA1 implicate molecular mimicry in the pathogenesis of neurological disease. Neurosci. Lett. 401, 188-193 (2006). Kalume, F. Molecular mimicry: cross-reactive antibodies from patients with immune-mediated neurologic disease inhibit neuronal firing. J. Neurosci. Res. 77, 82-89 (2004). Levin, M. C. Cross-reactivity between immunodominant human T lymphotropic virus type I tax and neurons: implications for molecular mimicry. J. Infect. Dis. 186, 1514-1517 (2002). Lee, S. A potential link between autoimmunity and neurodegeneration in immune-mediated neurological disease. J. Neuroimmunol. 235, 56-69 (2011). Smeenk, R. J. Antinuclear antibodies: cause of disease or caused by disease. Rheumatology (Oxford). 39, 581-584 (2000). Lee, S. Post-translational glycosylation of target proteins implicate molecular mimicry in the pathogenesis of HTLV-1 associated neurological disease. J. Neuroimmunol. 204, 140-148 (2008). 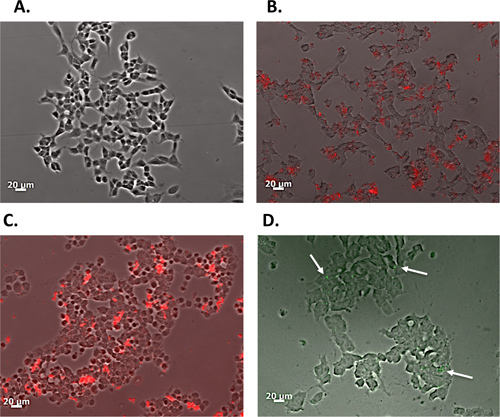 Reisinger, H. Serum-free transfection of CHO cells with chemically defined transfection systems and investigation of their potential for transient and stable transfection. Cytotechnology. 60, 115-123 (2009). Weill, C. O., Biri, S., Erbacher, P. Cationic lipid-mediated intracellular delivery of antibodies into live cells. Biotechniques. 44, Pvii-Pxi (2008). Radic, M. Z. Heterogeneous nuclear ribonucleoprotein P2 is an autoantibody target in mice deficient for Mer, Axl, and Tyro3 receptor tyrosine kinases. J. Immunol. 176, 68-74 (2006). Vincent, A. Successful 'passive transfer' of paraneoplastic stiff person syndrome with antibodies to an intracellular antigen. Brain. 133, 3164-3165 (2010). Vincent, A. Stiff, twitchy or wobbly: are GAD antibodies pathogenic. Brain. 131 (Pt 10), 2536-2537 (2008). Magrys, A. The role of anti-alpha-enolase autoantibodies in pathogenicity of autoimmune-mediated retinopathy. J. Clin. Immunol. 27, 181-192 (2007). Geis, C. Stiff person syndrome-associated autoantibodies to amphiphysin mediate reduced GABAergic inhibition. Brain. 133, 3166-3180 (2010). I am interested in obtaining a reprint of his paper. I am preparing a paper and I have interest in reviewing this work. Posted by: KARLA Y. A. If you could give me your email I would be happy to communicate with you about this. Posted by: Joshua Nathan D.